One Spring night I wanted the window open to listen to the chorus of frogs singing away as I drifted off to sleep. 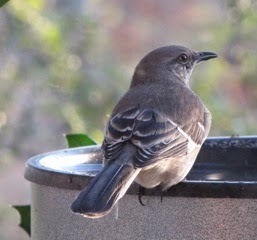 At some point they stopped and the Northern Mockingbird took over. He was such a virtuoso that I couldn't get back to sleep. I got up and went out to the front porch to take it all in at a much louder level. This guy was singing up a storm going from one bird song to the next. I heard the songs of the Tufted Titmouse, Eastern Cardinal, Gray Catbird, Blue Jay, Carolina Wren, Robin and quite a few more that I just couldn't discern at the time. Their songs are a long series of calls repeating each phrase 2-6 times before moving right into another new sound. Although male and female sing, unmated males are the most consistent singers, carrying on all day and late into the night. Brown Thrashers belong to the same family and can have a similar song, but the phrases are much less varied and they don't go on for as long as the Mockingbird uses them. 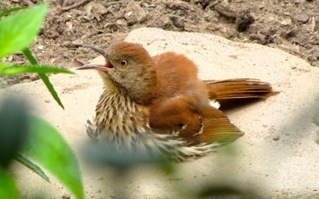 You can tell if it's a Brown Thrasher by counting the same sound. They stop at 2-3 calls. 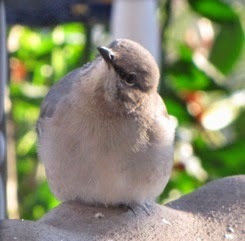 Gray Catbirds are also of the same family and can sound similar, but more nasal, hurried and slurred. I began wondering if the Mockingbird even had a song of its own to sing so I did some studying and was surprised to learn that their repertoire is their song. Not only do they mimic birds, but have been found to mimic frogs, crickets, squirrels, bells and sirens, a rusty gate or even the squeaks of a washing machine. 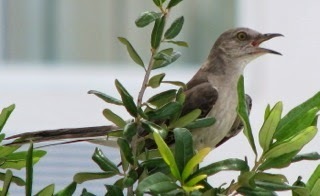 There is told a story that one Mockingbird near Miami mimicked an alarm clock so perfectly that it awakened people early every morning. Scientists find that the birds' singing coincides strongly with hormonal changes that are necessary for mating and nesting in the Spring and Summer. 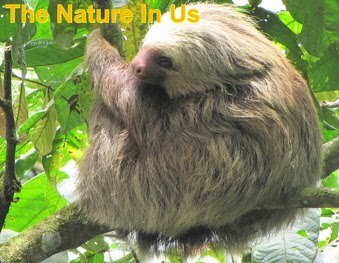 Unrestrained singing by males tracks production of their own testosterone, but it may also serve to "reset" the female's reproductive system. All this singing during the breeding season sends a message to the females. Life is rough and tough in the wild, where predators, disease and starvation are constant threats. The variety and depth of a male's song list is an indication to females that he's wise to the world around him and has survived for and established a territory with plenty of food, which is important for not only the females survival but of her future fledglings. Somehow it seems a bit sad that he doesn't have a song of his own to sing. I thought of the many Christians who never get to become who they were truly created to be because they were always trying to be somebody else that they wanted to be. We are all uniquely created with a plan and purpose for our lives. It's sometimes hard to believe that what we desire and enjoy so much could be just the thing that God made us to be. Instead we look around at what we think "being a good Christian" should look like and try to duplicate that and eventually we get very battle-worn and weary. Trying to be somebody you're not takes a lot of energy. 2 Corinthians 10:12 tells us that "they measuring themselves by themselves, and comparing themselves among themselves, are not wise." Whose song are singing? It's important that we find our true purpose in life. Lie is not about doing good things, but about being who God made you to be. If we go through life doing good rather than God things, we will always feel a bit tired, used and abused because we are walking in somebody else's shoes. Busyness is not what pleases God. Jesus had a very short time of ministry and He never hurried or rushed. We certainly don't need to get ourselves all wound up over DOING to where we forget about the BEING that God made in us. Think about what you do naturally? Jesus only asks that we be ourselves. We seem to think we have to suffer to be of service to God. Not so. Being YOU is a delight to Him since He is the One who created you as you naturally are. So, spend some time with Jesus and find out what you have been made to be and do. And don't become a busy "doer." In Mark 6:31 Jesus called His disciples come apart to a desert place for rest. Many eager Christians neglect the needs of their physical bodies and cut their ministries short through death or severe illness. In like manner they don't take time to be still and know God (Ps. 46:10). This cuts ministry short through non-effectiveness. One of Satan's deadliest weapons against those involved in ministry is busy-ness. We must balance time ministering to others with time of being ministered to by our Father or the devil will get you "burned out" and "fed up." Learn to say "No, thank you" to all the many requests people have to turn you aside from time with the Father and aside from who God made you to be. Be confident that God will bless less work that is anointed by Him more than works that just fill our calendar book.